Two great games were played in the Eastern Conference opening week of CEFL Championship. Both were won by Serbian teams in the last moments, with a touchdown and a field goal. Kragujevac Wild Boars have slated an important win against the great Istanbul Koc Rams, while Belgrade SBB Vukovi scraped by the ameliorated Cowbells team in Budapest. After multiple unsuccessful drives in the first quarter by both teams, Koc Rams opened the scoring session in Kragujevac. An 82 yard shot play by their quarterback Quentin Williams to a former Wild Boar, Ivan Pavlovic lit up the board. An ironic coincidence takes care of tying the score. Strahinja Stepovic who played for the Rams last season returns the kickoff to half field first and then catches the pass by the quarterback Ian McGinnis in the end zone. Next, the Wild Boars hand the ball over near the 50 yard line, after a botched punt attempt. Williams takes the opportunity and ups the score with a 25 yard touchdown pass to Kaan Özer. That was all the Turkish champion could muster, as the Wild Boars’ crushing defense left them scoreless in the second half. Their offense kept the momentum going and capped the following drives with a couple of McGinnis’ touchdowns to Filip Nedeljkovic. The Rams had the ball last, but their efforts to tie the game were thwarted by the opposing defense that drove them back near the goal line to end the game with the final score 21-14. The game was delayed twice because of heavy rain and lightning safety, but the fans on the stadium were determined to stay until the very end. They were awarded with a tough game by two equal rivals and the Wild Boars were sure not to disappoint them in the end. 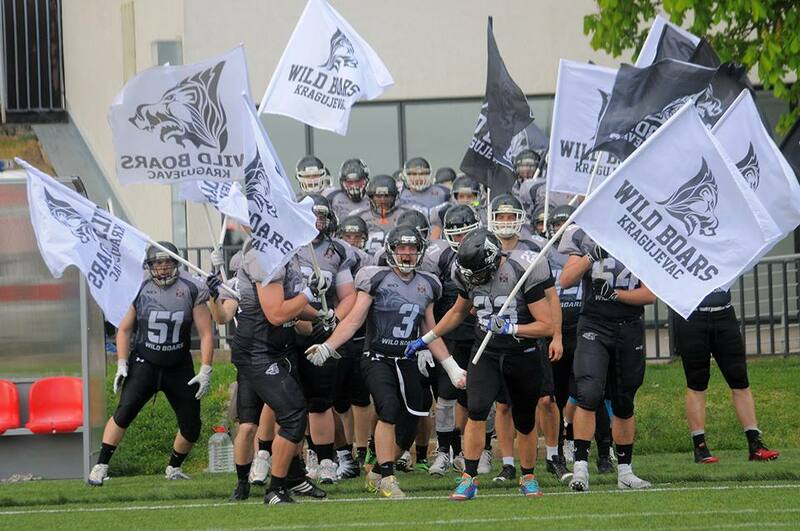 They are half way toward the CEFL Bowl with only Budapest Cowbells standing in their way. The Hungarians were a step away from a win themselves today, losing to SBB Vukovi in the last quarter by 24-27. CEFL Cup Eastern group has played one of its games today as well, when Indjija Indians faced their neighbors Novi Sad GAT Dukes. Both offenses were choppy in the first period, leaving a lot of plays on the field. The Dukes were the first to put the points up in the second quarter over their running back, Jermicheal Selders. They garnished another series with a field goal and left the final drive in the first half to their adversaries. The Indians struggle was ended by the whistle, because they couldn’t connect for the score in the last two seconds. In the first play after the break, Indians former player Goran Zec returned the kickoff for 70 yard touchdown. Indians still could find their pace, and GAT Dukes took advantage of that, running the clock. Finally, their quarterback Christopher Jeffrey rushed for a score himself to end the game at 0-23.